Nathan Deal carried all but one of the 13 Oconee County precincts in the Aug. 10 Republican primary runoff for governor, according to the official Statement of Vote Cast for the county. Deal received 60.2 percent of the 4,024 votes cast in the Republican runoff in the county, and 50.2 percent statewide. Of the Oconee County precincts, Karen Handel carried only the precinct of Farmington in the far south of the county, where she got 58, or 53.7 percent, of the 106 Republican votes cast. She received 48.5 percent of the 270 votes in the City Hall precinct, her next best performance. Most of that precinct is in the city of Watkinsville. A total of 4,142 Oconee county citizens voted on Aug. 10, and all but 118 (2.9 percent) of them chose to vote in the Republican primary. In addition to the governor’s runoff, Republicans could cast a ballot to decide the party nominee for attorney general, commissioner of insurance and public service commissioner of eastern district 2. Oconee County voters favored Sam Olens (55.8 percent) over Preston Smith for attorney general, Ralph Hudgens (66.6 percent) over Maria Sheffield, and Tim Echols (51.7 percent) over John Douglas. 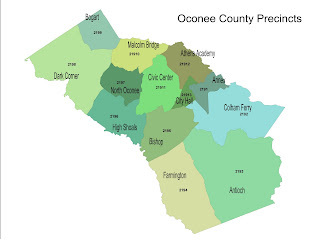 In all cases, Oconee County went with the state-wide winners. Oconee County’s Democratic voters favored Georganna Sinkfield (56.8 percent) over Gail Buckner in the party’s sole runoff for secretary of state. Sinkfield won statewide. Oconee County Republicans voted much like voters in neighboring counties in the Republican gubernatorial runoff. In Barrow County, Deal got 62.5 percent of the vote. He got 58.3 percent in Clarke County and 60.0 percent in Oglethorpe. In Greene County, Deal got 57.2 percent of vote, while in Morgan County he got 53.5 percent and in Walton County he got 56.0. Handel, of course, did best in her home county of Fulton, where she got 71.3 percent of the vote. The turnout rate in Oconee County for the Aug. 10 runoff was 20.5 percent, compared with a turnout of 29.8 percent in the July 20 primary. The county eliminated nearly 2,000 voters through the voting process, however, and only 20,239 voters were counted as properly registered for the runoff, compared with 22,225 in the July 20 primary. In the Aug. 10 runoff, 4,024 Republican ballots were cast, while 5,804 Republican ballots were cast on July 20. In the Aug. 10 runoff, only 118 Democratic ballots were cast, compared with the 824 Democratic ballots cast on July 20. Of the 4,142 votes cast in the Aug. 10 primary, 86.0 percent were cast on election day. In the July 20 primary, 74.1 percent of the 6,628 ballots were cast on election day, with most of the remainder cast through early voting. The Statement of Votes Cast for the elections reassigns the early and absentee mail ballots to precincts, making it possible to determine how the candidates did in the various precincts in the county. That report was released on Aug. 13. In the July 20 primary in Oconee County, Deal had a higher percentage of the Republican votes for governor than did Handel. From the field of seven candidates, Deal got 33.6 percent of the Republic vote to 26.7 for Handel. Handel beat Deal handily in the Farmington precinct, and had nearly the same percentage as Deal in the City Hall precinct. These were Handel’s strongest precincts in the August runoff. Farmington was the Oconee County precinct with the highest percentage of voters asking for the Democratic ballot in the July 20 primary. Civic Center and City Hall were next highest, in that order.